A Native American ­owned startup with all of the promise in the world, CMW Media jumped at the chance to tell the unique story of CannaNative. With a mission of empowering the true economic sovereignty of Native nations located throughout the U.S., CannaNative is on a path to restore cannabis – both hemp and marijuana – cultivation, production, and more. CannaNative is led by former tribal chairmen, all of whom are proven business professionals and community leaders with backgrounds and connections to the highest levels in the U.S. government. This is history in the making. In true CMW Media style, CannaNative exploded on the cannabis scene. With the stigma already around medical marijuana, CMW Media overcame years of misunderstanding between the United States, the U.S. news media, and Native American culture to break this story. CMW Media embarked on a series of interviews with the executive leadership at CannaNative and began to chronicle one of the most historic moments in the cannabis industry. The process took CMW Media several weeks to produce, but the results were well worth the time and effort. Media interviews kicked off with the lead cannabis writer over at Bloomberg News. And when the Bloomberg article went live in September 2015, CMW simultaneously issued a press release to promote the news. As a direct result of this press blast, CannaNative went from an unknown entity to media sensation overnight. Since the press release and interview went live, CannaNative has been featured in Bloomberg, BusinessWeek, Fortune, Time Magazine, Yahoo! 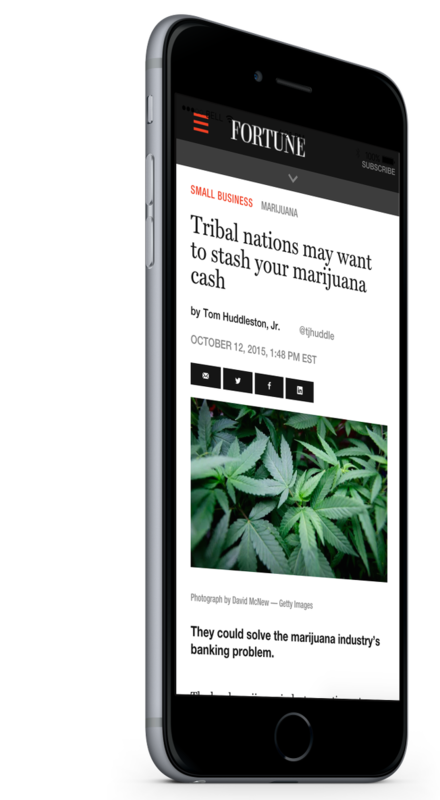 News, and several cannabis trade and Native American press outlets ­­ the kind of coverage a just ­born company dreams of!